Classic french patisserie eclairs filled with a pumpkin cream cheese frosting, salted caramel and coated with a maple glaze! Pumpkin maple eclairs. With November well and truly on its way out, in here in the UK it means that our very small window for getting pumpkin anything is closing. So of course I stocked up and made puree for the rest of the year because I can’t get enough. But for you normal people these are the last few weeks that you will be able to enjoy pumpkin. 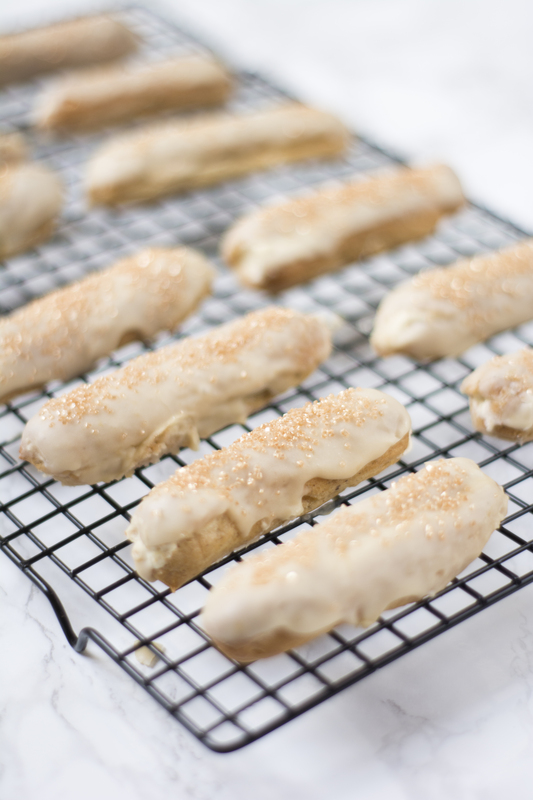 This pumpkin maple eclairs recipe was actually inspired by Tatyana over at Tatyanas Everyday Food. I came across the image on her Pintrest and I happened to have some of the same golden sprinkles she used and half a bottle of maple syrup. Sam loves eclairs and maple syrup and I love pumpkin so pumpkin maple eclairs were a match made in heaven. I added a drizzle of caramel to Tatyana recipe as I had some left over from another baking session and it goes so well. Don’t worry about being neat piping the caramel as its only supposed to be a surprise burst of flavour. 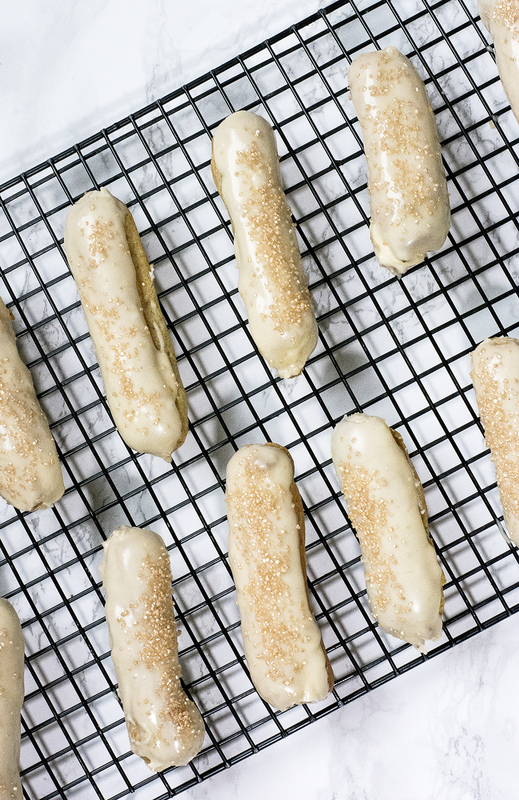 Tip: getting the eclairs the same size every time is hard, to make things easier grab your baking paper and turn it over and using a ruler and a pencil draw 4″ lines on the baking paper to use as a guide. Flip the baking paper over and pipe over the lines. Pre-heat your oven to 200C. Line a baking tray with baking paper and spray with non stick cooking spray. Sieve your flour onto a sheet of baking paper. In a medium pan over a medium heat, add the water butter and salt. Heat until the butter has melted but do not allow the water to begin to boil and evaporate. Turn the heat right up and bring the mixture to the boil very quickly, tip in all of the flour in one go and remove from the heat. Beat the mixture with a wooden spoon very hard and very quickly, really go for it, let build up those baking muscles. Don’t worry if it looks a mess. Pop the pan back on a low heat and continue to stir until the dough cooks a little and forms a glossy ball of dough in the pan. Transfer the dough to a mixing bowl and leave to one side. Beat the eggs with a whisk and gradually add them to the dough. Beat the mixture with a wooden spoon to combine. You are looking for a dough that is very glossy and shiny and has the consistency of a paste. Spoon the dough into a piping bag fitted with a 1/2 inch round piping nozzle. Pipe 12 x 10cm lines of dough onto your lined baking tray. Sprinkle the tray not the pastry with water and bake for 15 minutes. Without opening the oven door, after 15 minutes, turn your oven down to 170C and bake for a further 10 minutes. Remove the tray from the oven and carefully pierce a small hole in the side of each eclair to allow steam to escape. Return the eclairs to the oven for another 5 minutes. After 5 minutes the pastry should be completely crisp. Remove from the oven and leave to cool completely on a wire cooling rack. In a mixing bowl add the cream cheese, pumpkin puree, spices and maple syrup. Whisk for a few minutes until everything has combined and you have a smooth mixture. In another bowl, using an electric whisk, whisk together the cream and the sugar until stiff peaks form. Add the pumpkin mixture and whisk together until you have a smooth cream. Add the cream to a pastry bag fitted with a small round piping nozzle or a long pastry filling nozzle. Once the caramel has cooled, transfer it to a piping bag and using a thin piping nozzle, insert the nozzle into the eclair, hold the eclair vertically to let gravity help and gently squeeze the bag filling the eclair with a little caramel. Don’t over fill, we only want a drizzle in each. Transfer the cream into another piping bag, again using a thin piping nozzle. Insert the nozzle into the open end of the cooled eclair and fill with cream. Fill it fully this time. Sieve the sugar into a mixing bowl, add the cream and the maple syrup a little at a time stirring constantly. Keep adding and stirring until you have a smooth icing. 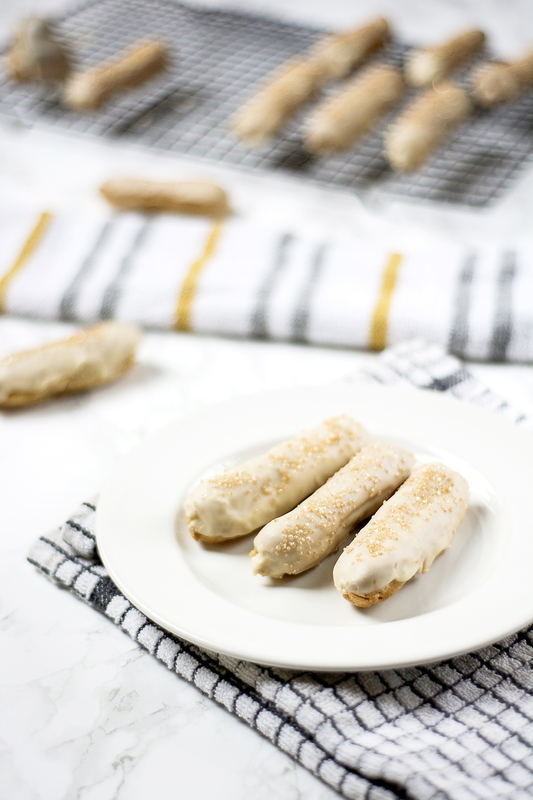 The consistency should be thin enough to easily dip your eclairs into. 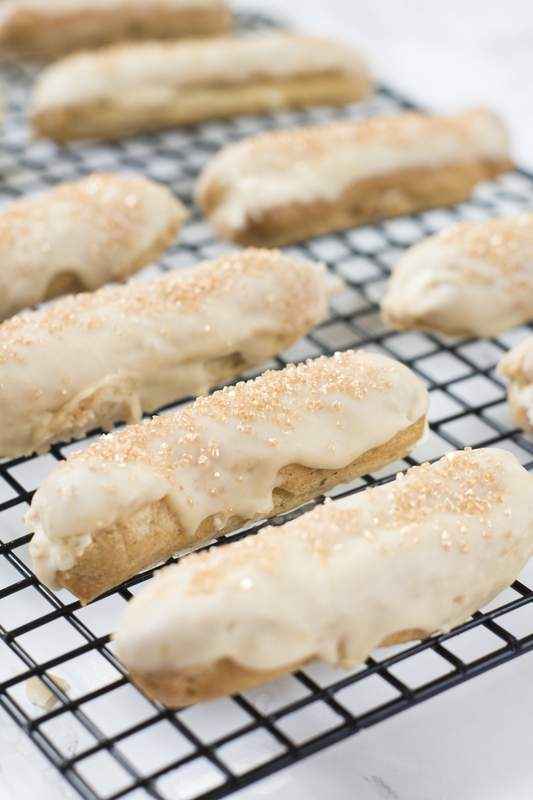 Dip the top side of your eclairs into the glaze one at a time and leave to set on a wire cooling rack. Optional: Sprinkle the eclairs with edible glitter and serve. And there you have it, my pumpkin maple eclairs. If you give this recipe a go let me know how it goes by tagging @whatseatingmanchester in your social media post!for more festive baking inspiration check out my blog. naturally like your web site but you have to check the spelling on several of your posts. Many of them are rife with spelling problems and I find it very troublesome to tell the truth nevertheless I’ll definitely come back again.